For the first time since WW II, overt fascists hold real power in Europe. Radicalized ultranationalists. Anti-Semites. Hate-mongers. Cold-blooded killers. Whitewashing high crimes. A puppet regime. America’s newest colony. Mocking democratic values. Violating fundamental rule of law principles. Unaccountably. Western leaders won’t explain. Nor will the media. Hard truths are buried. Ukraine’s government usurped power forcibly. Putschist rule has no legitimacy. Especially regimes waging war on their own people. Murdering them in cold blood. Committing horrendous human rights abuses. Tolerating no opposition. Ruling by intimidation. Force-feeding neoliberal harshness on impoverished people. Making life unbearable overall. More on this below. Legitimate editors wouldn’t touch this rubbish. Journal editors featured it. Beginning-to-end misinformation. Deception. Big Lies. Fact: Ukrainian-style democracy is none at all. Pure fantasy. Fact: Presidential and parliamentary elections were farcical. Illegitimate by any standard. Fact: Whole families won parliamentary seats. Fact: Poroshenko’s son, Oleksiy, represents Vinnitsa region’s No. 12 precinct. Fact: The same one his father represented years earlier. Bequeathed to his son. “…Ukraine’s political class is built on the foundation of nepotism and cronyism, as all the political forces display the tradition of nominating candidates on the grounds of kinship. Russia’s Foreign Ministry said parliamentary elections “were marked by an unprecedented number of gross violations of basic international standards for democratic elections, which were recorded during the election campaign, election day and vote counting. A year passed since” Maidan protests, said Poroshenko. Followed by “the Revolution of Dignity,” he claimed. Fact: Right Sector neo-Nazis murdered Kiev residents and police. Fact: Ousted President Viktor Yanukovych was wrongfully blamed. Fact: Fascist snipers used automatic weapons. Fired from Philharmonic Hall’s rooftop and windows. Overlooking the Maidan. Clear evidence proved it. Fact: Washington orchestrated what happened. Putschists practically lived at its embassy. It was coup d’etat headquarters. Ukrainians want democratic freedoms. Responsible governance. Verboten notions for fascists. Ruling by brute force. Poroshenko’s governance is more deform than reform. Saying “Ukraine is finally ready to build a robust state” denies reality. So is claiming a Moscow threat. None whatever exists. No evidence suggests otherwise. “On the external front, we are united in fighting for our freedom and for our future as an independent nation – a fight that has implications for all of Europe and global security,” said Poroshenko. Fascists deplore freedom. Crushing it for unchallenged control. Ukrainian independence was lost. Washington controls its newest colony. Poroshenko its puppet leader. Presiding over a police state apparatus. Ruling by intimidation. Serving at America’s discretion. Remaining president as long as he remembers who’s boss. A second White Book covers the period April through July 2014. Calling conditions “aggravated in all areas.” Worse than ever. Including illegitimate fascist rule. Brazen pressure and threats. Severe repression. Physical violence. Suppressing press freedom. Terrorizing independent journalists. Harassing and beating them. No-holds-barred brutality. Like Nazi Germany. History has a disturbing way of repeating. Core elements are unchanged. Ukrainians were betrayed. Expect worse ahead, not better. Kiev’s dirty war continues. Without mercy. Against Donbas residents. Wanting real democracy. Rejecting fascist rule. Putting their lives on the line for freedom. A testimony to courage. Deserving universal support. Their liberating struggle continues. Largely on their own. Russia the only nation providing vitally needed humanitarian aid. Kiev wanting millions of Donbas residents isolated. Denied what people need to survive. Attacked with heavy weapons. Illegal ones. Russia’s updated White Book (its 3rd edition) contains documented evidence of new crimes and abuses. Especially “social and economic strangling” of Donbas residents. Noting neo-Nazi mass marches. Mass graves discovered contained hundreds bodies of Nazi-style extrajudicial executions. Russia’s Foreign Ministry urged international organizations and media to report non-politicized assessments of what’s ongoing. Kiev caused Donbas area catastrophic conditions. Up to 60% of homes were destroyed or seriously damaged. Regime authorities tried blocking Russian aid. Convoys of mercy. “The fundamental position of the Russian Federation remains unchanged,” its Foreign Ministry said. Moscow has verifiable information of unjustifiable political imprisonments. 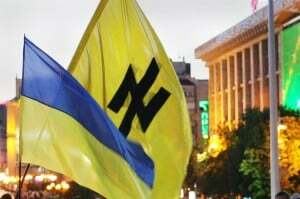 “The period under review was characterized by the rapid degradation of the situation in the field of freedom of expression and restrict the activities of undesirable Kiev government media,” according to its updated White Paper. Political censorship is rife. All popular Russian TV channels are blocked. “The rapidly developing practice of political persecution and widespread persecution of the politicians supporting an approach different from Kiev held a cynical course,” Russia’s White Book says. Especially killing, terrorizing and imprisoning journalists. Maidan killings. The Odessa massacre. Using force disproportionately. Murdering civilians. Targeting children. Downing MH17. Mass graves with extrajudicially executed victims. Use of prohibited weapons. Other war crimes too serious to ignore. “It is crucial that the Ukrainian authorities stop the ‘bandaging’ and begin an independent, impartial, effective and transparent investigation,” Russia’s White Book said. Accountability is long overdue. So is honest MSM journalism. Reporting hard truths. Explaining fascist ruthlessness in Europe’s heartland. Unbridled brutality defines it. Preventing regional peace and security. Risking the unthinkable. War without end. Spilling cross-border. Open conflict with Russia. Nuclear war with America involved. Risking humanity’s survival. Lunatics in Washington make anything possible.